Montana is home to some of the most important T. rex discoveries (and fossil discoveries in general). For example, a rancher came upon a partially complete Tyrannosaurus skeleton on the Charles M. Russell National Wildlife Refuge in 1988. The find included its skull and the first complete T. rex forelimb. A bronze cast of the specimen, known as “Big Mike,” stands outside the Museum of the Rockies. In the late 1800s, Othniel Charles Marsh and Edward Drinker Cope were among the leading experts in paleontology. Their love of fossil discovery was only outmatched by their hatred for each other, both men used underhanded methods to sabotage the other’s work in what would become known as “The Bone Wars.” This war between Marsh and Cope found its way to the southeastern badlands of Montana, where Cope went exploring just weeks after Custer’s defeat at Little Big Horn. Marsh, who had more resources at his disposal, employed spies to watch Cope and shut him out of new finds. A fictionalized account of this Montana bone battle can be found in Dragon’s Teeth, a novel by Michael Crichton (of Jurassic Park fame), published posthumously in 2017. 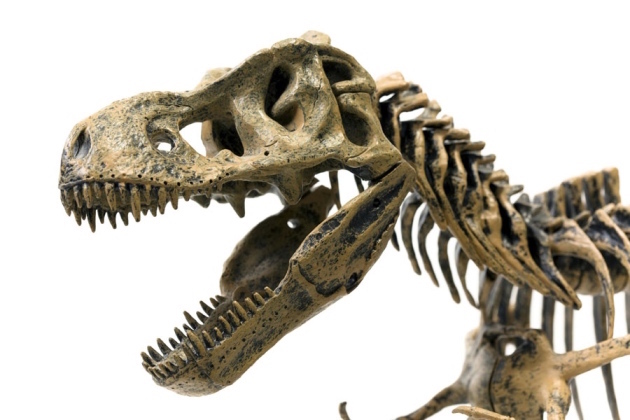 In 1978, the scientific view of dinosaurs forever changed when Bynum resident Marion Brandvold discovered bones along the Rocky Mountain Front. The site was studied by paleontologists Bob Makela and Jack Horner, who determined that the bones belonged to infant duckbilled dinosaurs. One year later, “Egg Mountain” was discovered nearby. This site contained thousands of individual egg, baby, and adult fossils—indicating a nesting ground. Many of the remains belonged to infants that would have been hatched for some time. It was hypothesized that the young dinosaurs had remained at the nesting ground because they were still being cared for by their mothers, hence the species’ name Maiasaura peeblesorum, or “good mother dinosaur.” This discovery marked the first indisputable evidence that dinosaurs were capable of any sort of complex behavior.